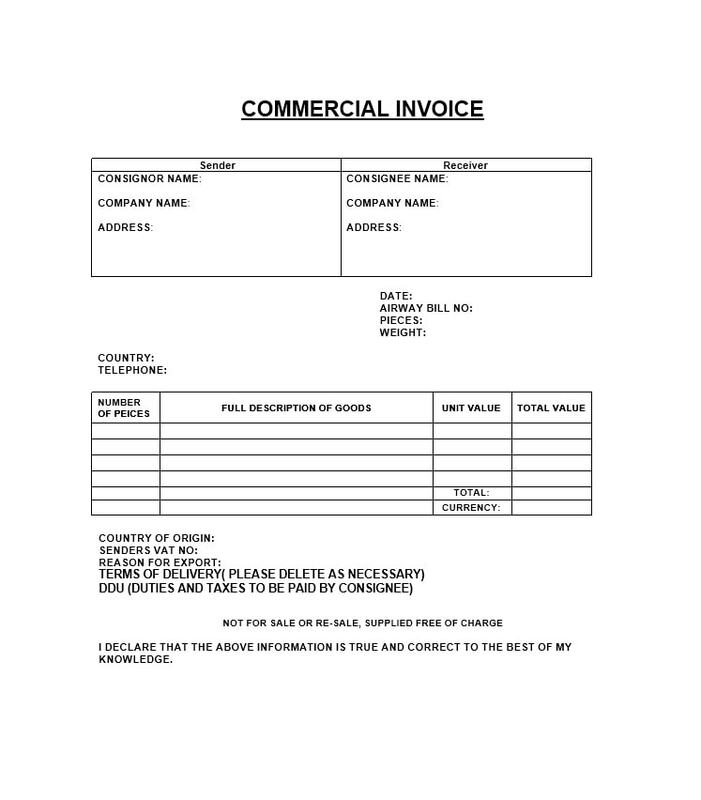 Simply put, a commercial invoice is a document which serves as proof of transaction between a buyer and a seller. 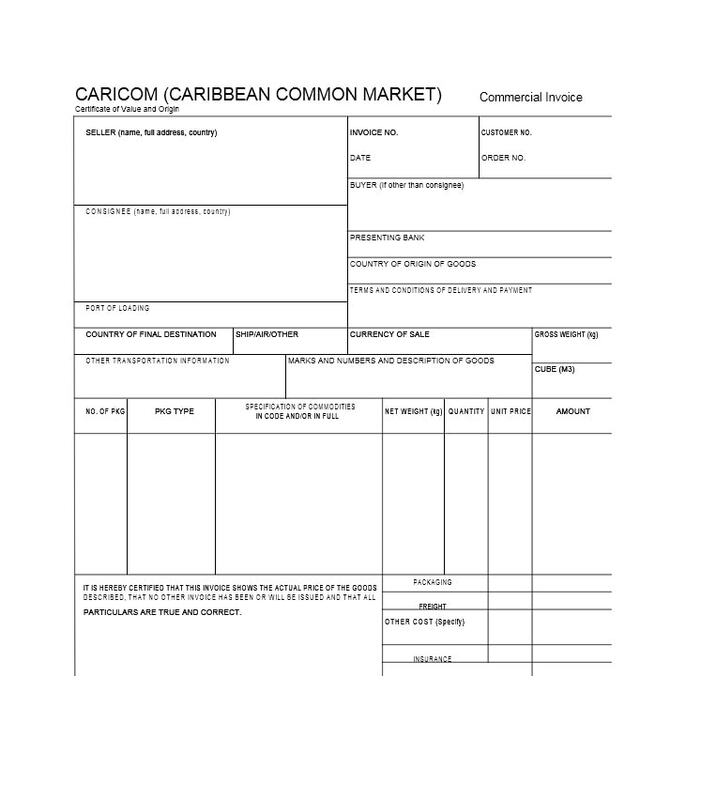 It can also be used by customs to establish the worth of imported merchandise for the evaluation of duties and taxes. 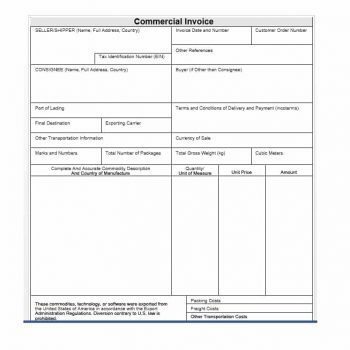 2 When are Commercial Invoices Used? 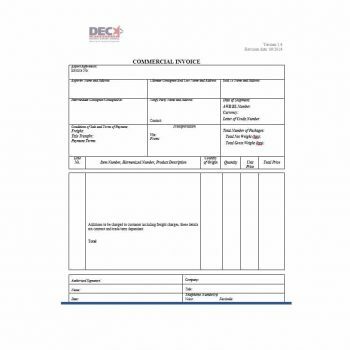 This document is prepared by the seller and must contain the right information. 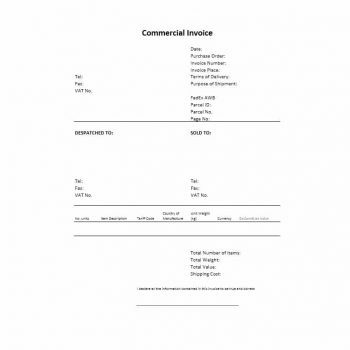 By itself, a commercial invoice doesn’t grant rights to ownership of the merchandise or goods – unless it comes with an attachment which contains the total amount of payment of the person who is importing the merchandise. 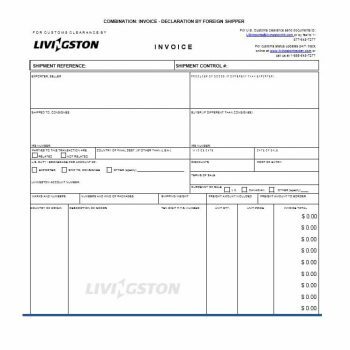 Most often, the seller gives an original copy of the invoice to the buyer and keeps a copy for himself. However, if the merchandise is to be imported, more copies may be given as needed. 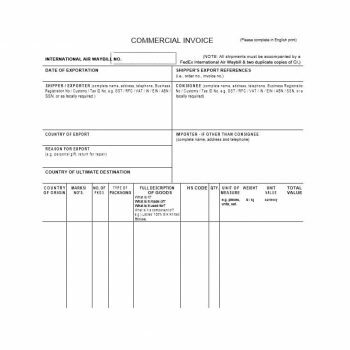 Commercial invoices must contain all the essential information needed so when it is used and inspected, there will be no unnecessary delays with customs. 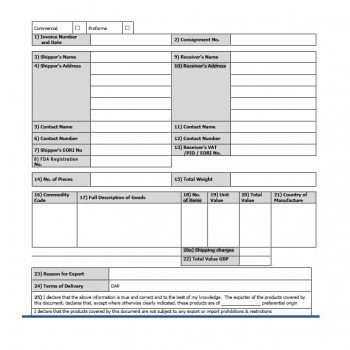 In this article, you will learn all about this document as well as how to make your own template and how to create your own official template. 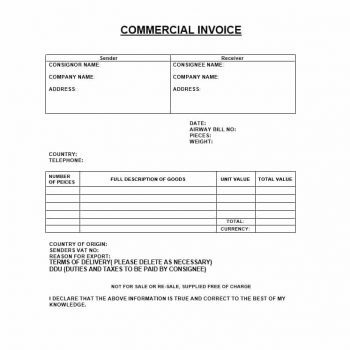 When are Commercial Invoices Used? 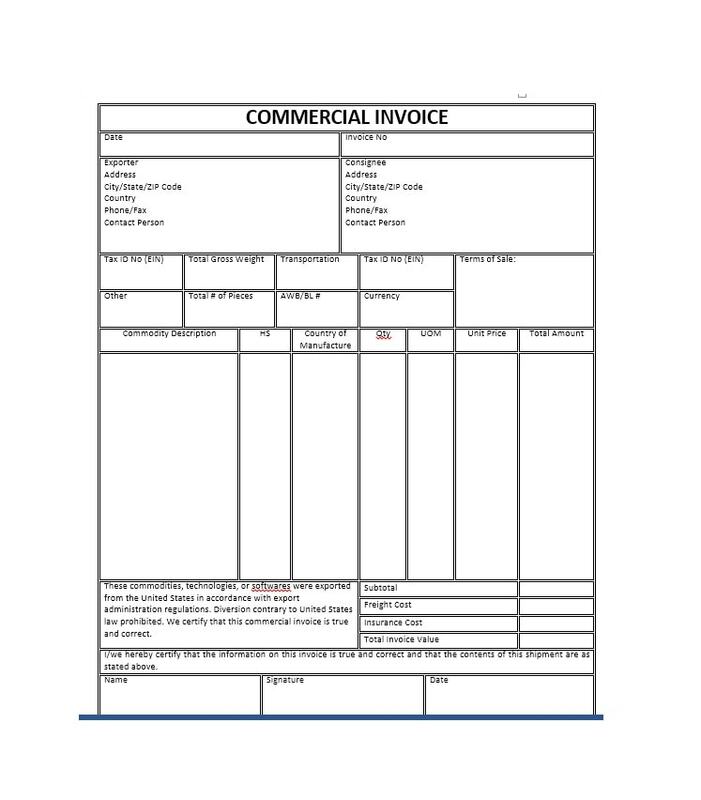 Commercial invoices are important documents which can be used for different purposes. 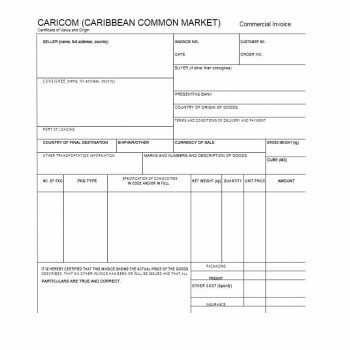 Sellers and exporters must know how and when to give these out as well as how to fill them up correctly. 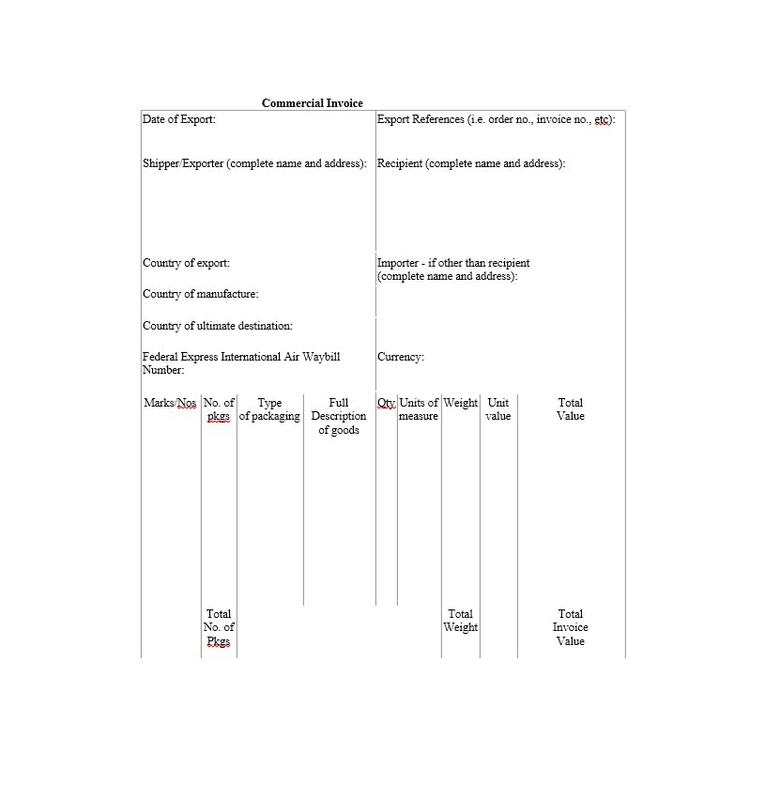 Buyers and importers must also have ample information about these documents so that they are prepared whenever these documents are asked for. As an exporter, you will be able to use this to support your insurance claims, loans and grant programs. Having this on hand will allow for faster and smoother transactions when presenting requirements. Both the buyer and the seller can use it as a record or as proof for items which have been bought/sold. 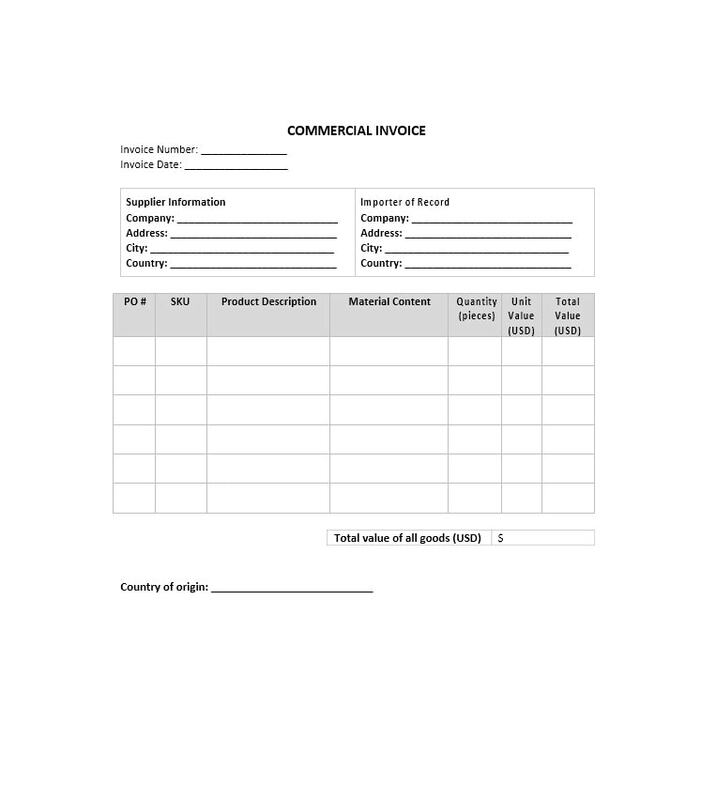 Having records of items sold and purchased is beneficial for financial recording and accounting purposes. The buyer or importer can make use of it to issue the funds for payment through the bank to the seller or exporter. 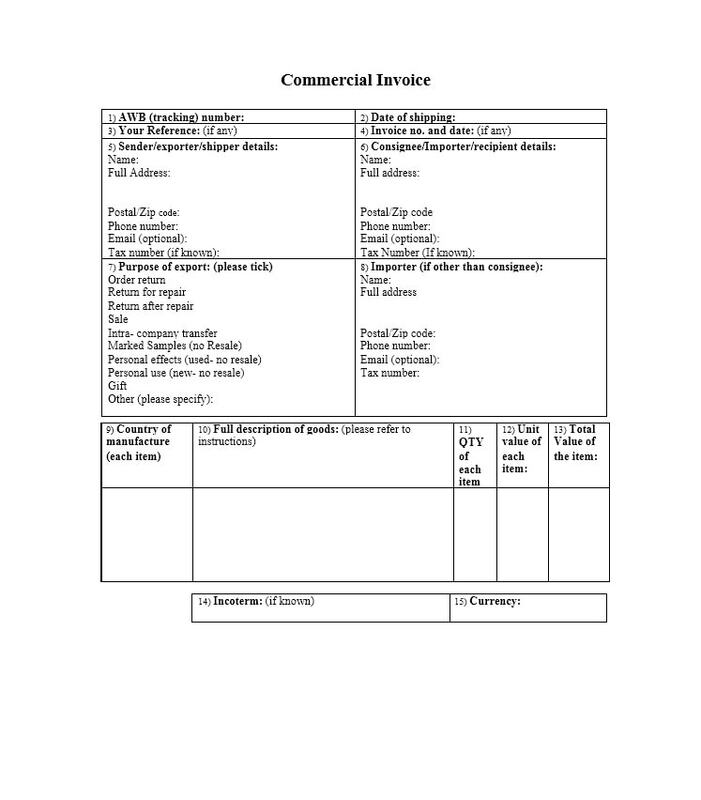 Without a commercial invoice, the bank may refuse to issue funds, depending on their policies. 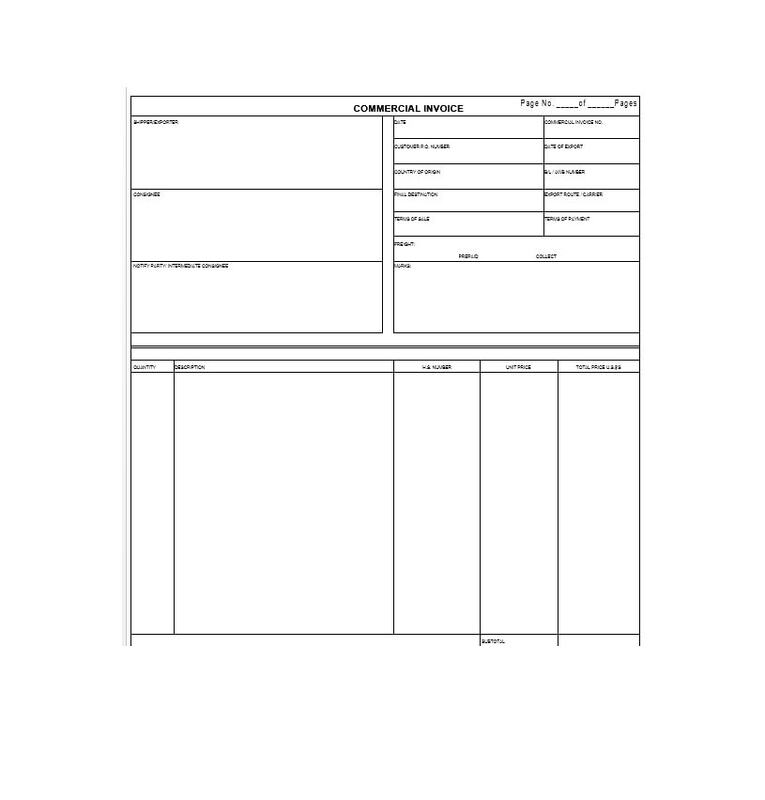 This would serve as the main supporting document for when there is an insurance claim on a particular shipment. 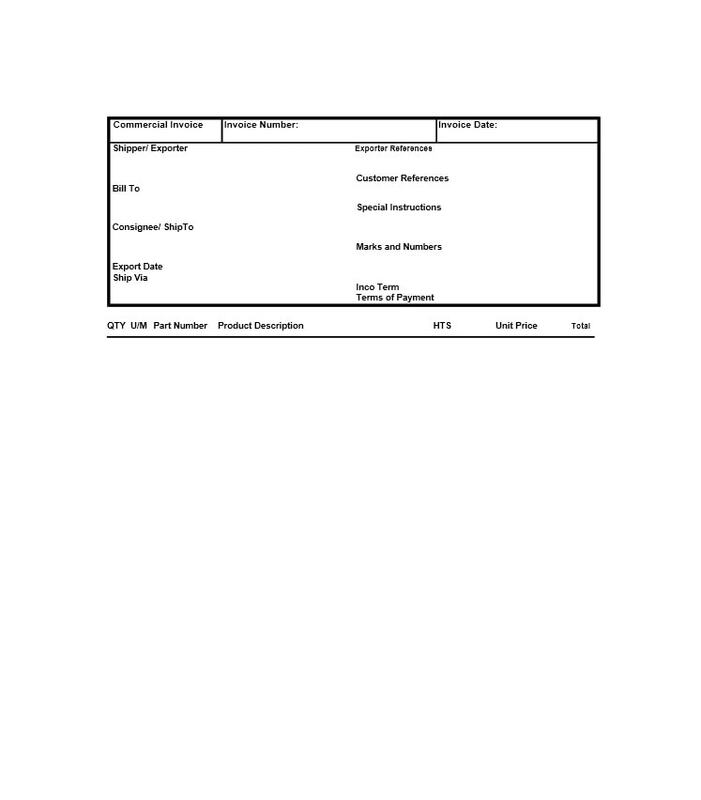 In order for the insurance claim to be given, an official invoice would need to be presented. 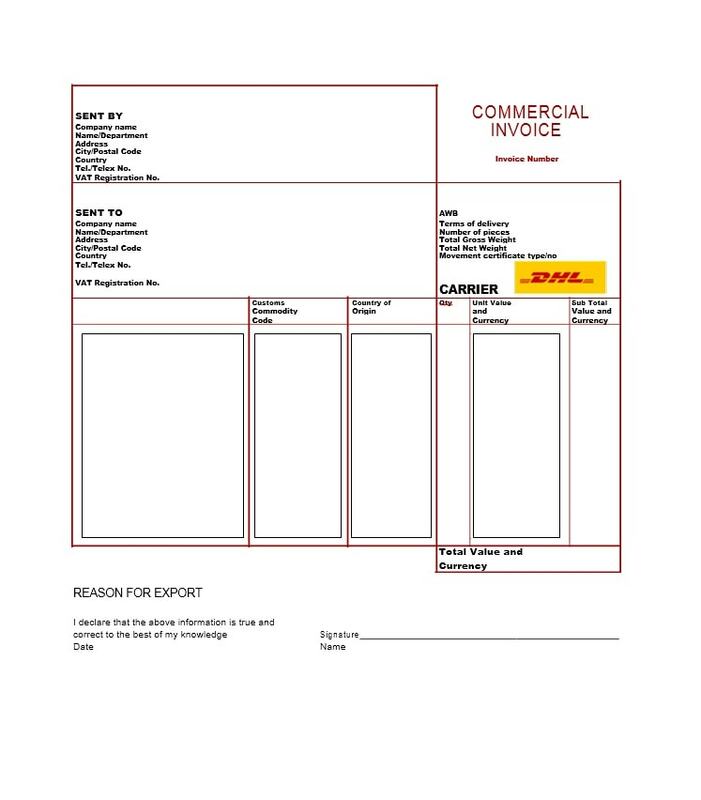 When the goods are shipped to another country, the importer would have to be able to hand this over before the merchandise can be cleared through customs. Without it, the goods might be held at the airport until other requirements are presented, which would be very inconvenient. 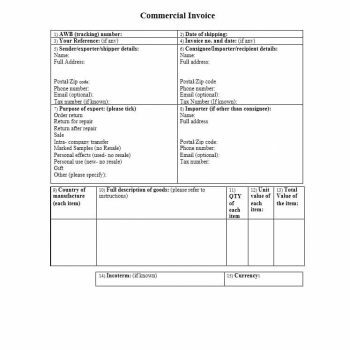 Banks would have to inspect the commercial invoice before giving out money under a letter of credit or documentary collection. 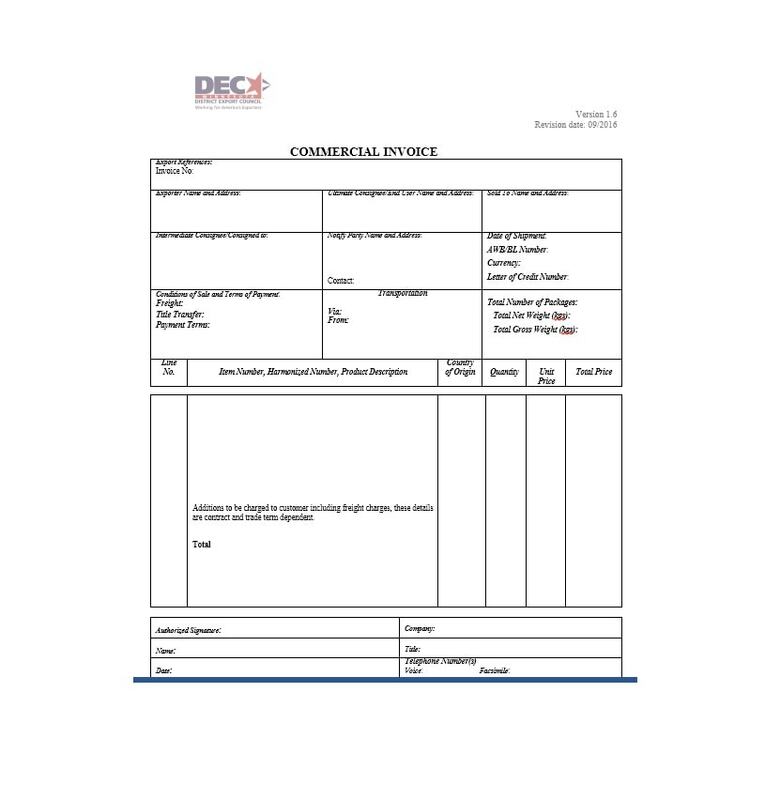 This document can also be used in conjunction with other documents (like an inspection certificate), which would serve as evidence that what you are shipping is of the best quality and is exactly what your customer has ordered. It can also be used by the government to determine the worth of goods or merchandise when assessing duties. 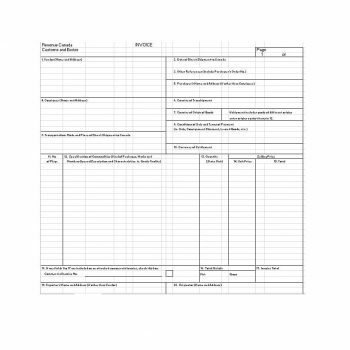 For customs authorities, this can also be used for the same purpose as well as for recording of statistics and for inspection. It can serve as a binding contract when a transaction is made and it can be used as a key requirement in import licensing procedure by some countries. 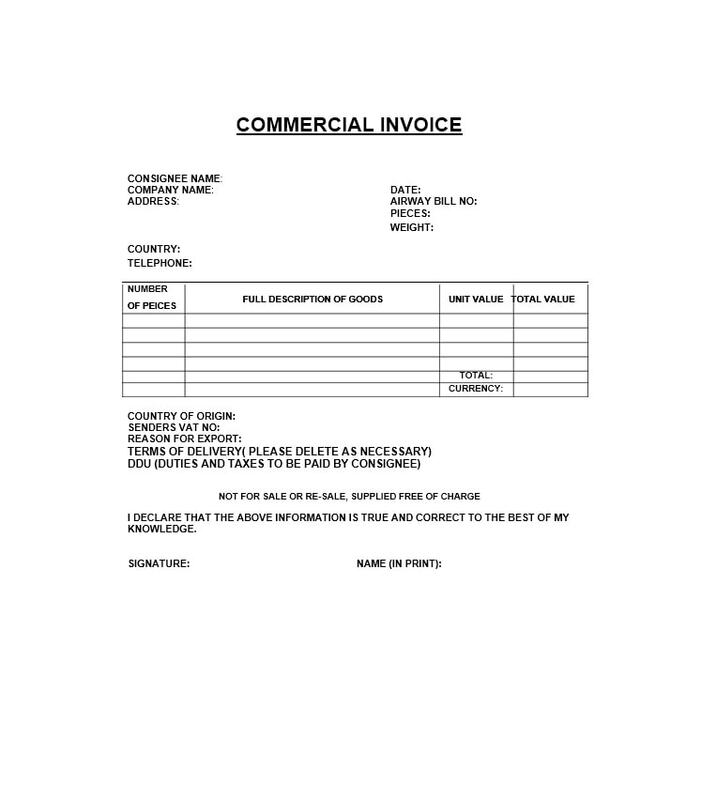 As you can see, commercial invoices are important documents, for a number of reasons. So it would be very helpful to learn all you can about them. Full name, full postal address and contact details of the seller. Full name, full postal address and contact details of the buyer. If in the case of merchandise being shipped, the full name, full postal address and contact details of the person the merchandise is to be shipped to. 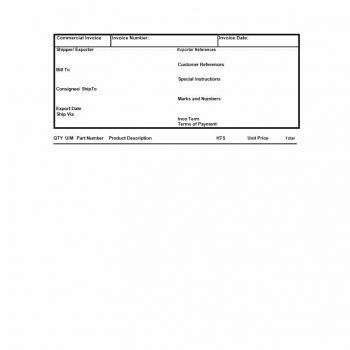 Reference number, date of issue of the invoice and the number of the order for the merchandise. 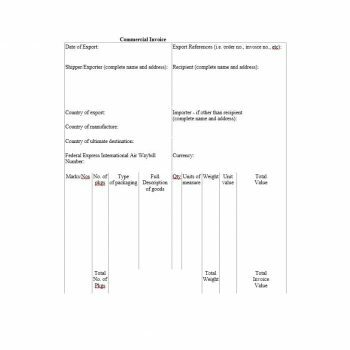 Complete description of the goods, including any marks, numbers, quantities, kind and weight. Detailed trade narrative of the merchandise in plain English. Quantity of the merchandise along with their net and gross weight. Price and currency of the merchandise. 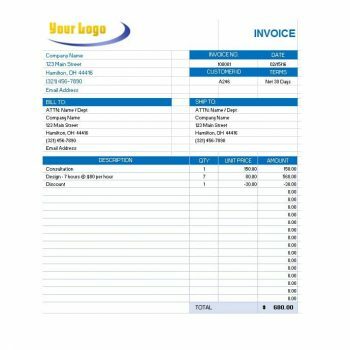 Any discounts and additional charges, if any, to verify the prices specified in the invoice. Time and mode of payment and delivery. Country where the merchandise originated from. If the name of the manufacturer is present, it would be helpful but not required. Means of shipping and shipping route. 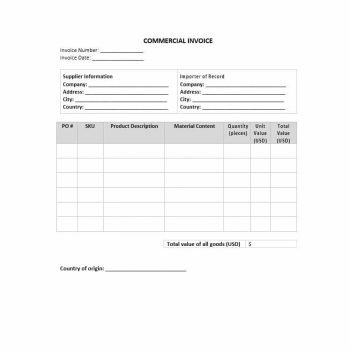 Date and reference to sales contract number. The time, date and place where the goods have been sold. A signature and date signed (the signor’s title can be placed too). All these items are needed in making a template. 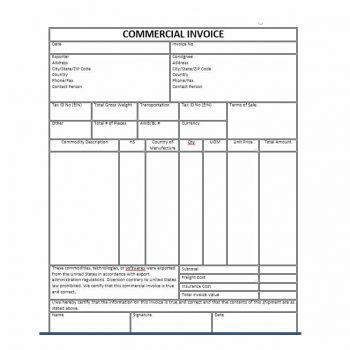 Further information about making and filling out a commercial invoice is given in other parts of the article. Also keep in mind that when you’re making the invoice, make sure to have one original signed copy as well as how many other copies are needed by both buyer and seller. 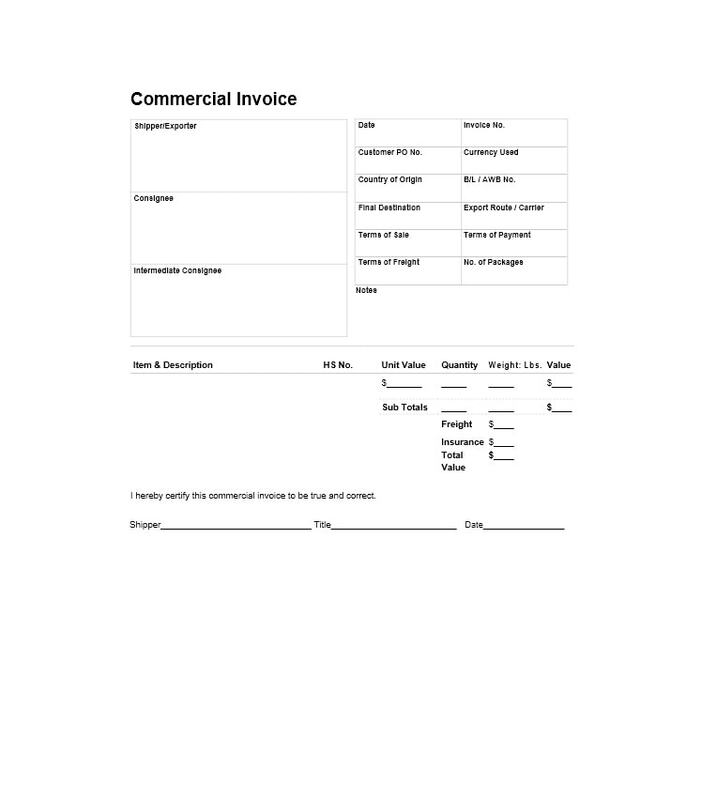 To have a good, solid reference, go online, search for and find printable commercial invoices which have already been pre-made. 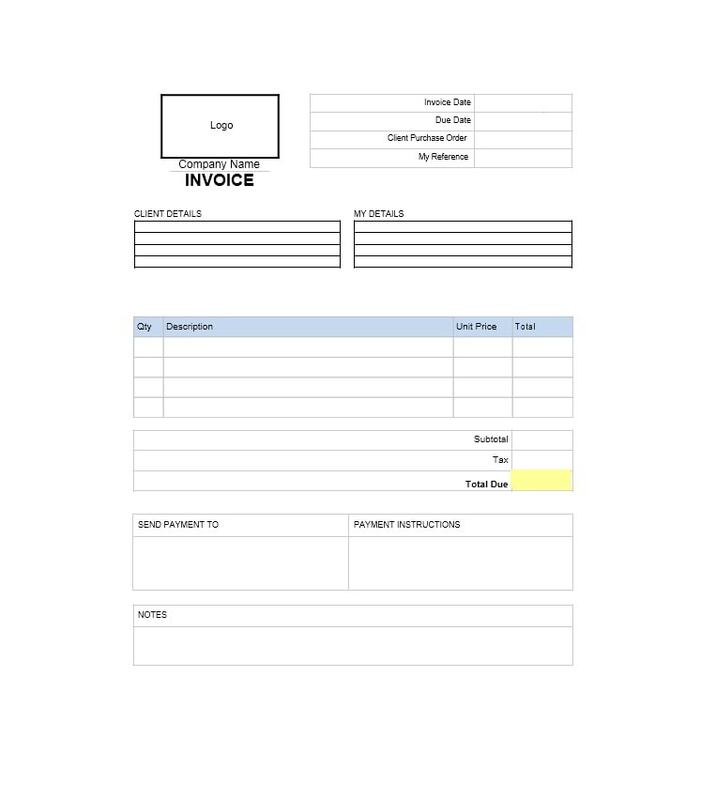 Lots of sites offer these and all you have to do is look through them and pick the one which you’d like your invoice to be similar to. 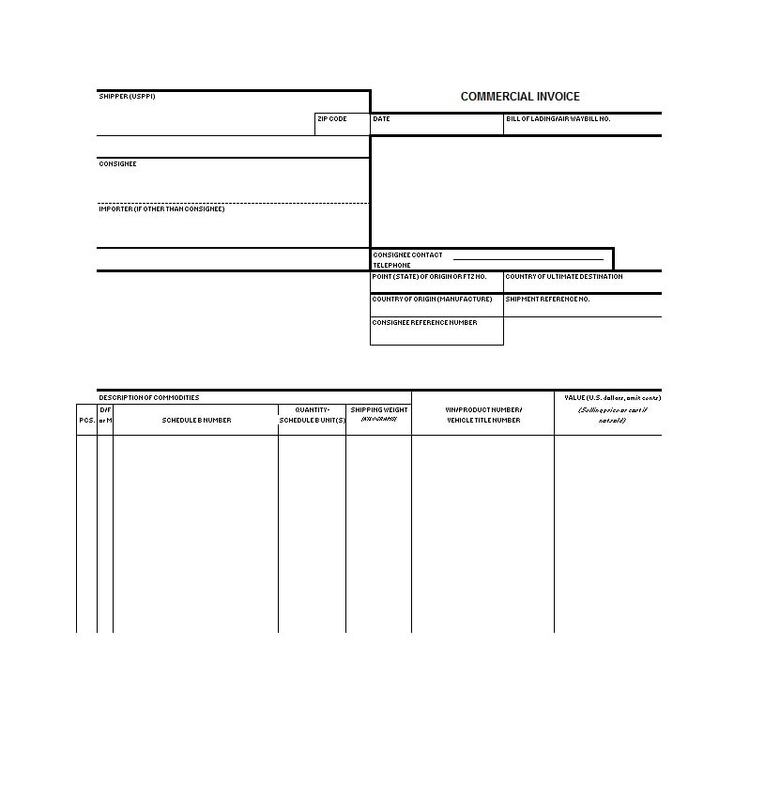 To gain a better understanding of the document, try to fill out the invoice online. 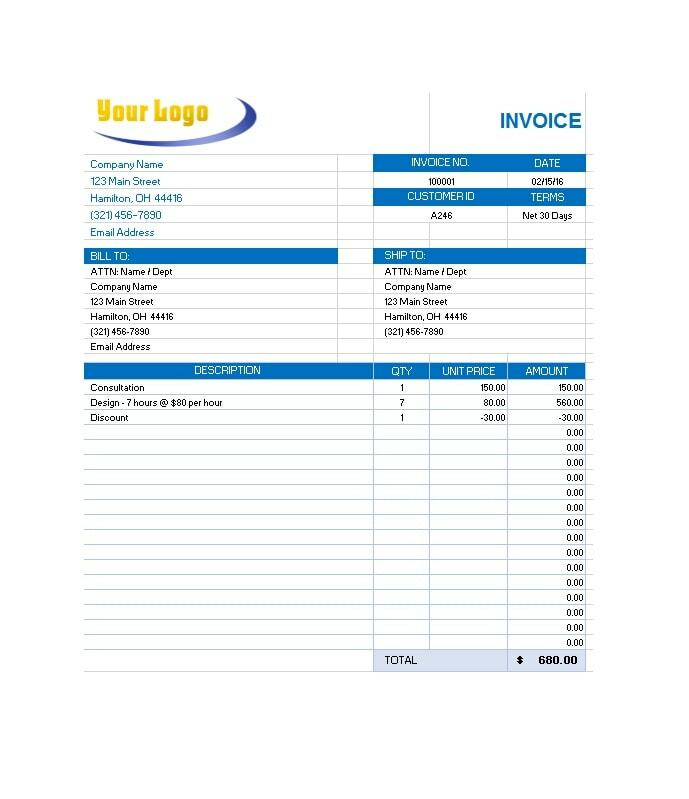 This will give you a better understanding of how you’d need to format your own invoice. 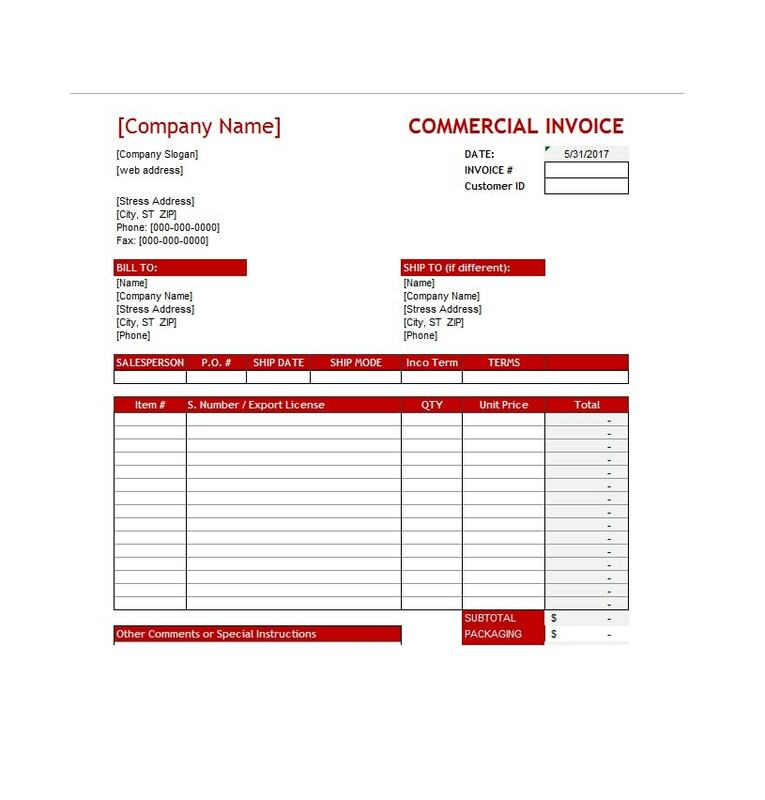 Using Microsoft Excel (or any spreadsheet program you are comfortable with), format and design your own commercial invoice template. 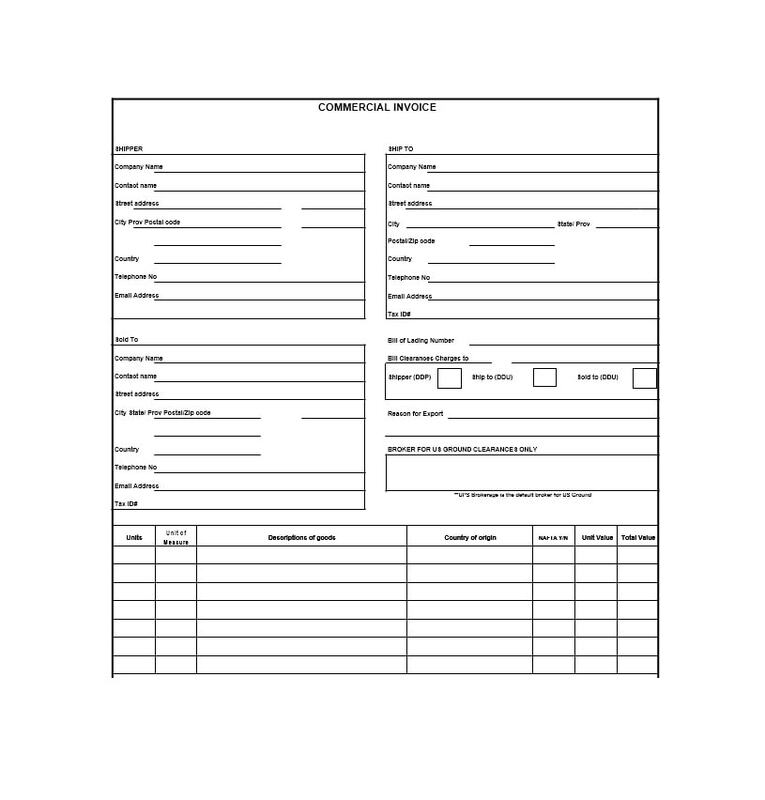 You can use the free, pre-made forms you find online as a guide in how you make your own version. 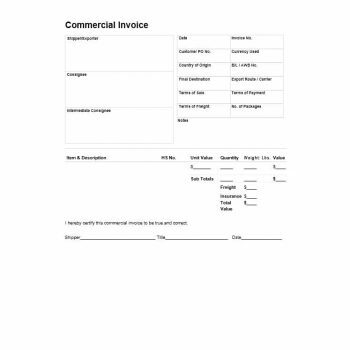 Create your invoice so that it caters to your own business and products for efficient commercial transactions in the future. 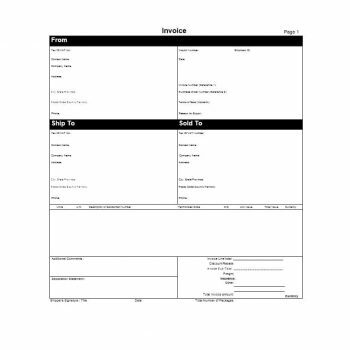 Along with the pre-made invoices, make sure you include all the necessary information to make your invoice official. Though there is required information, there is no specific or required format for it. 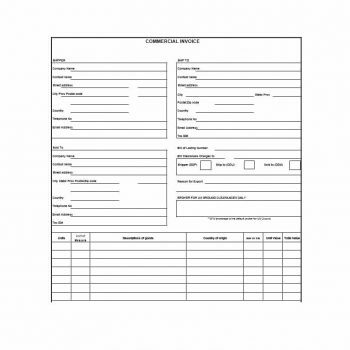 In order to save yourself a lot of time and effort, it would be better for you to work with pre-made forms rather than make your own from scratch. 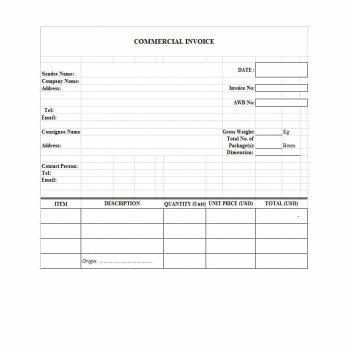 Commercial invoices have a lot of information on them and to be able to fill them up correctly, you must be able to understand all the terms written on them. 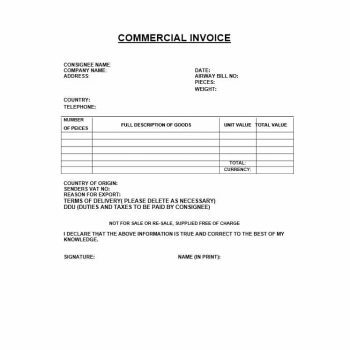 Read on to learn the most common terms found on any commercial invoice, for the benefit of buyers, importers, sellers or exporters. Shipper or Exporter refers you – the person or company which is selling, shipping or exporting merchandise commercially. 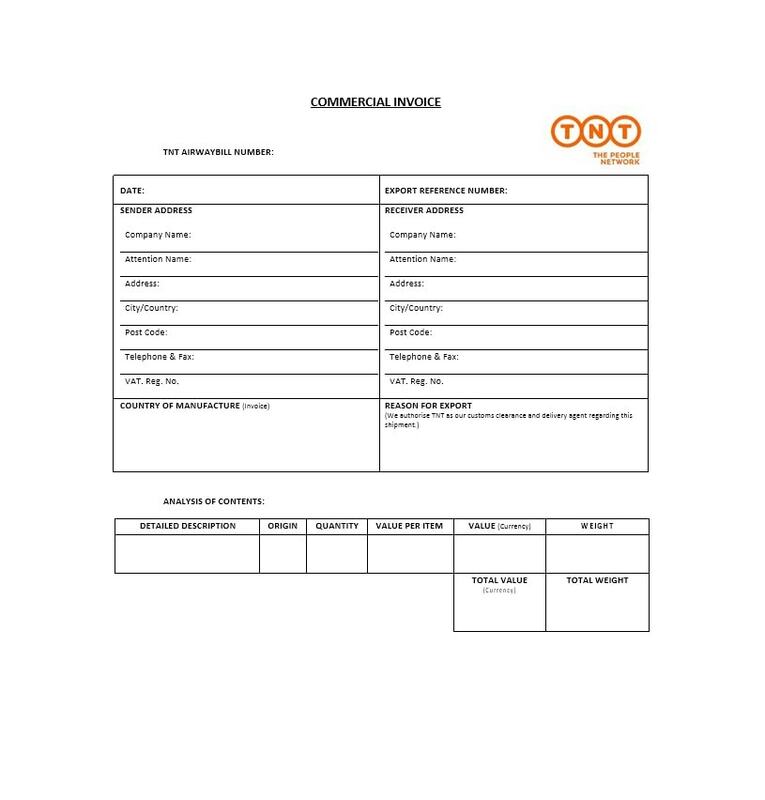 Consignee refers to the person or company where the purchased merchandise is being sent or shipped to. 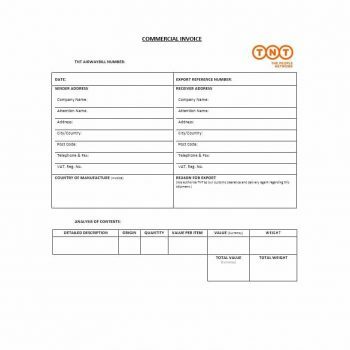 Intermediate Consignee refers to the person or company which would act as a liaison on behalf of the consignee in a different country, if any, to be able to complete the delivery. Date refers to the exact date when the merchandise is shipped and exported. 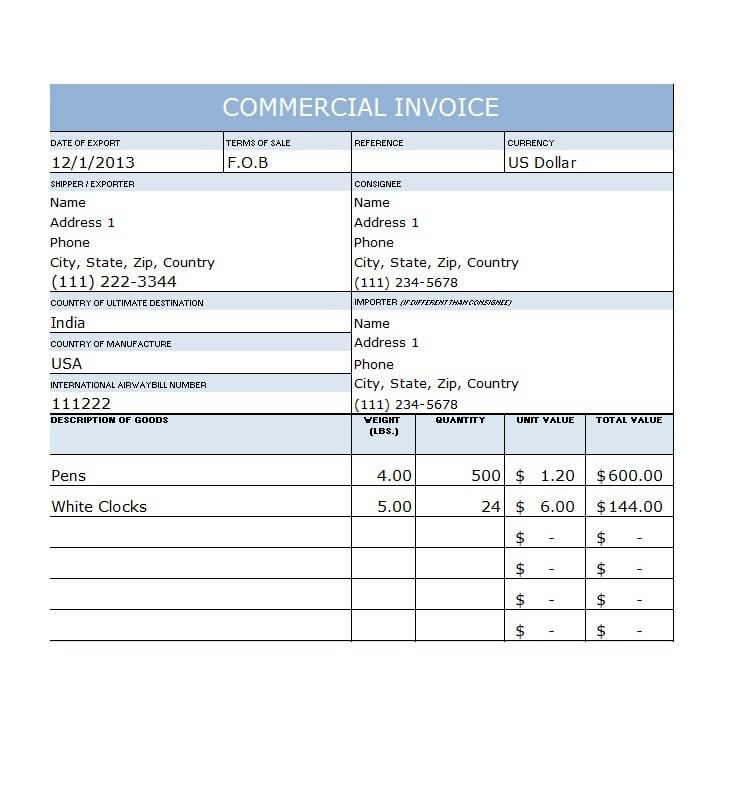 Invoice Number refers to the commercial invoice number, which is given by the seller or exporter. Customer PO Number refers to the reference number for order, which is given by the buyer or the customer. 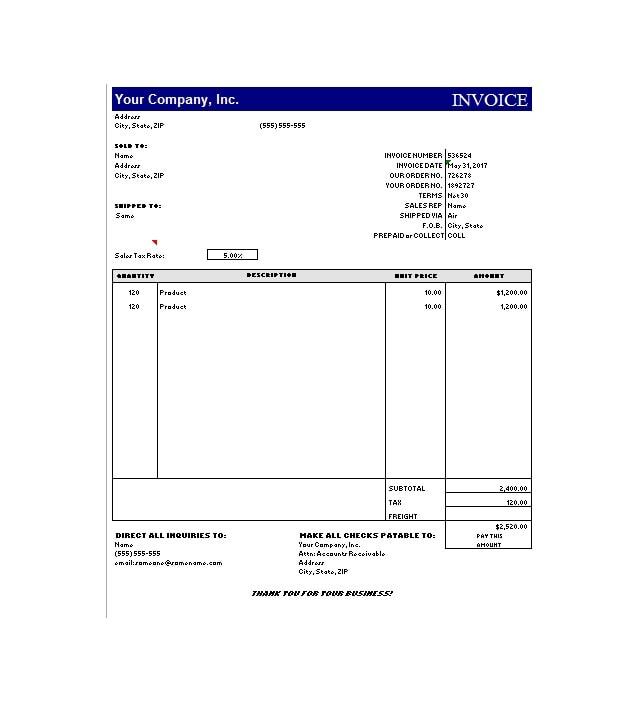 Currency refers to the actual currency used in calculating total amounts in the invoice. Country of Origin refers to the country where the merchandise came from. Country of Destination refers to the country where the merchandise is being exported or shipped to. Carrier refers to the company or the route which is used to export the merchandise. Terms of Payment refers to the terms and conditions, agreed upon by both the buyer and the seller. 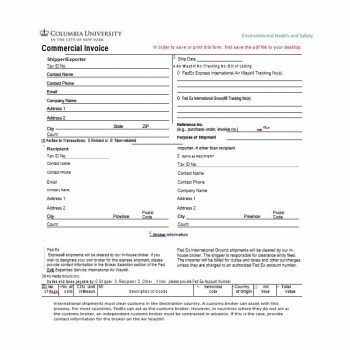 Terms of Freight refers to any and all terms and conditions which would apply to the whole shipping and delivery process. 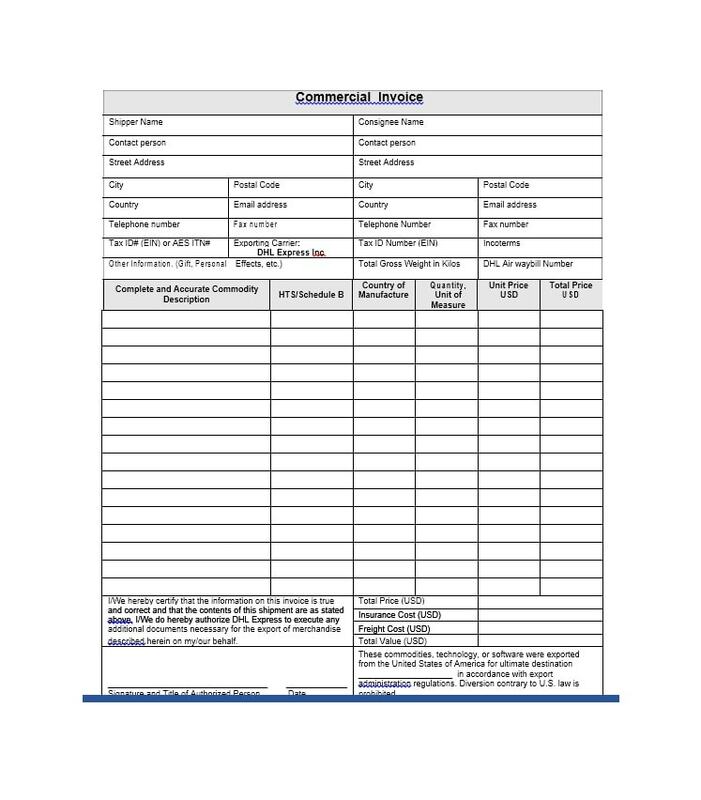 Notes refer to any shipment and delivery instructions from the buyer. 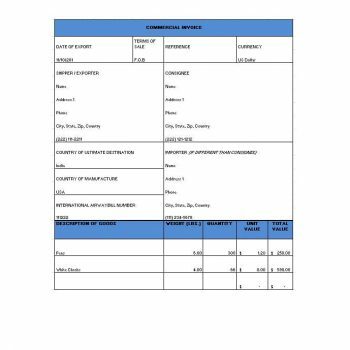 Unit Value refers to the cost of each of the items, individually. Weight refers to the total weight of all the items combined. Freight refers to any transportation charges. Insurance refers to any insurance charges. 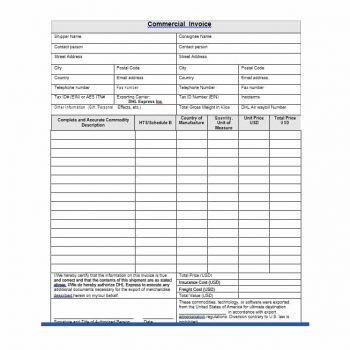 Signature refers to the title and signature of the shipper along with the date the merchandise was shipped. 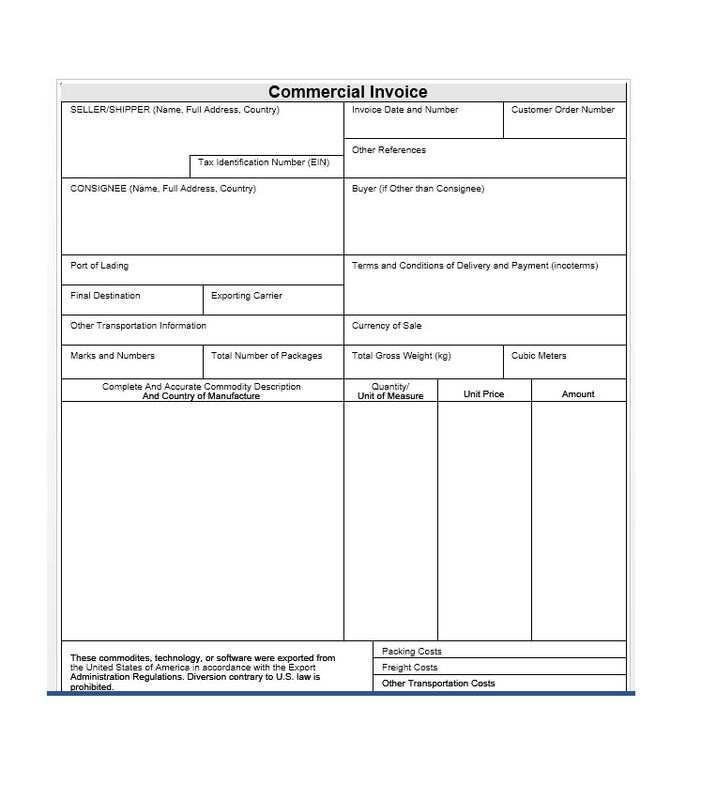 Knowing the definition of these terms commonly found on commercial invoices will help you fill out and understand them more. 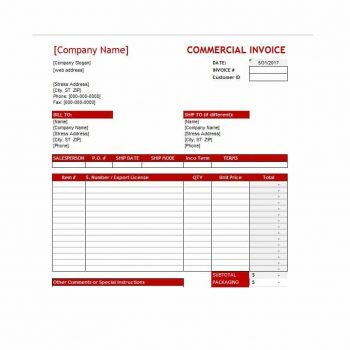 Things would be a lot clearer and you would be a lot more efficient in completing and giving out invoices. 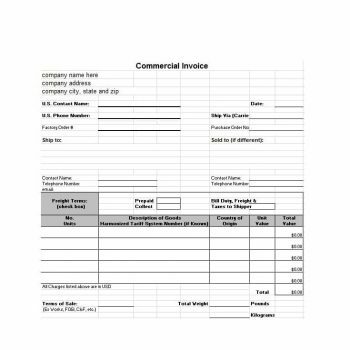 Now that you know how to make your own commercial invoice template and you’ve gone through definitions of the most common terms found in them, it’s time to understand how to fill up an invoice efficiently. 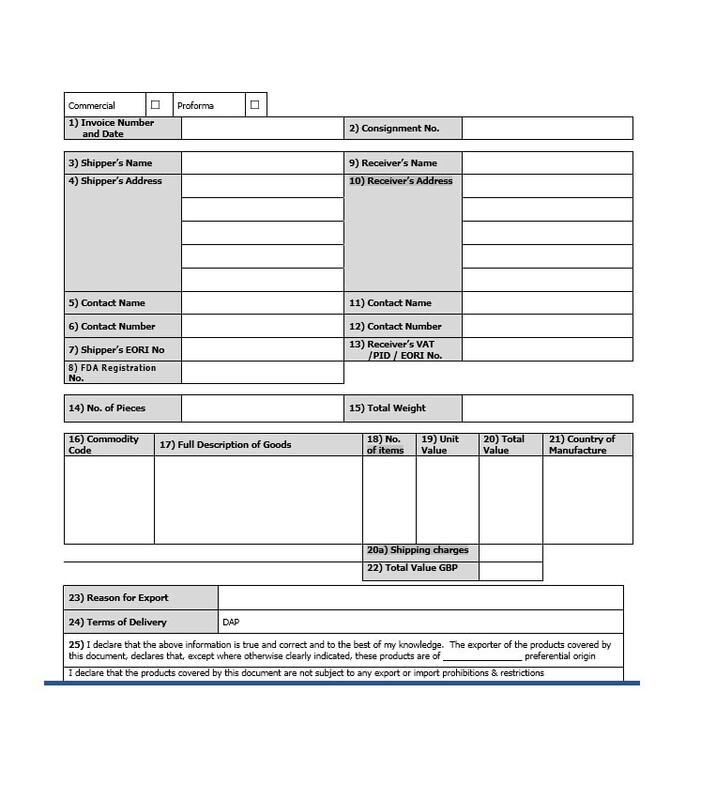 It is essential to know how to accurately fill these up in order to put the correct information on this important document. Supply the correct and complete information for the buyer, the seller and any intermediaries. 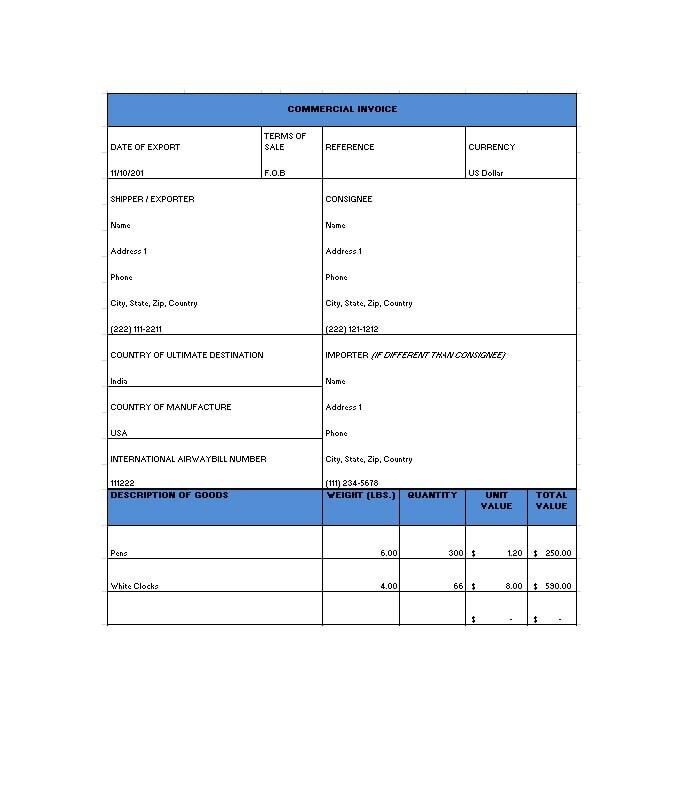 To complete this data, you’d need the name, full postal address (with the country code), contact number (also with the country code) and the tax ID or Social Security Number or any comparable government identification number. 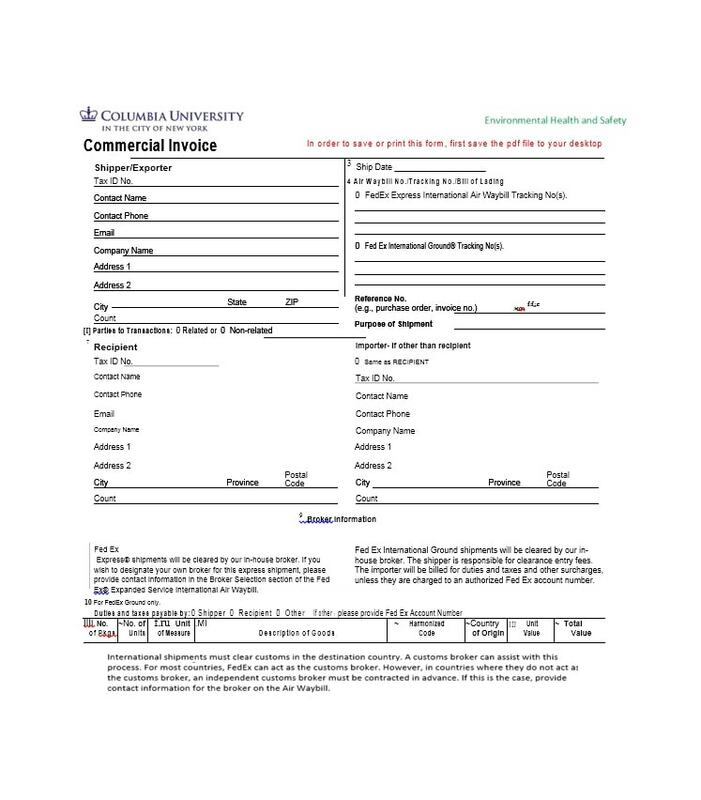 In the case of shipping items, the recipients may be referred to as the consignee while the buyer or sender may be referred to as the consignor. Completely supply all the details of the shipment. 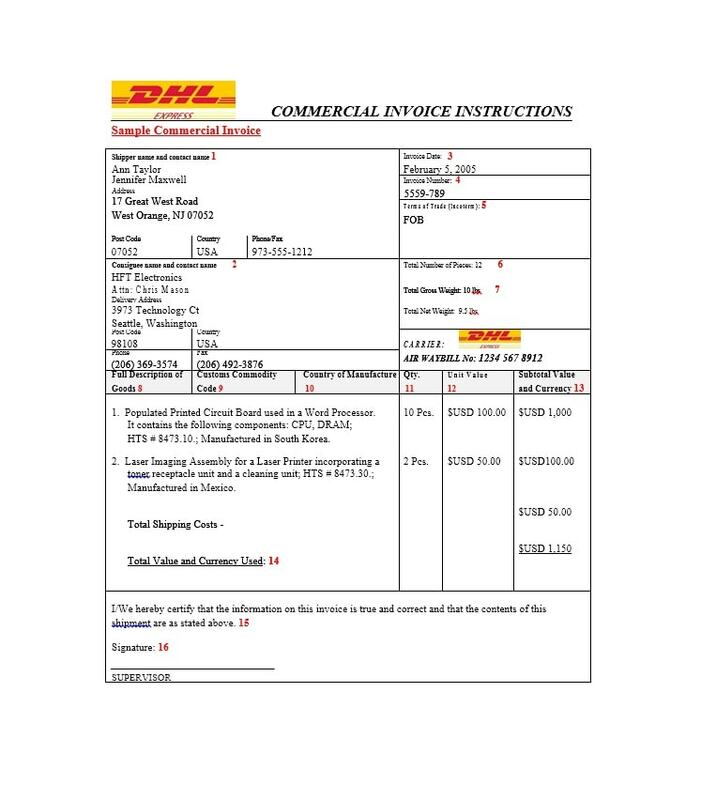 This data contains the exporter’s invoice number, reason/s for exporting the merchandise, the terms of sale, the waybill number or shipment ID – which the carrier will use to identify or track the shipment, the carrier’s name and the date the shipment has been exported. 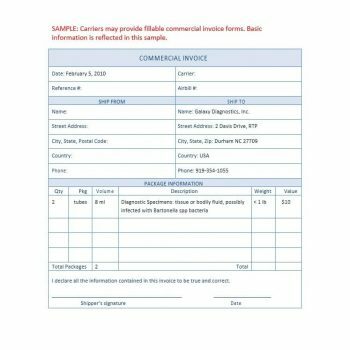 It would be good to note that some of the items listed above won’t apply to your sale or shipment so you don’t need to fill in those parts. The Terms of Sale is probably the most important item there as it contains a lot of information regarding the shipment and delivery process. Jot down the descriptions of all the items which are included. 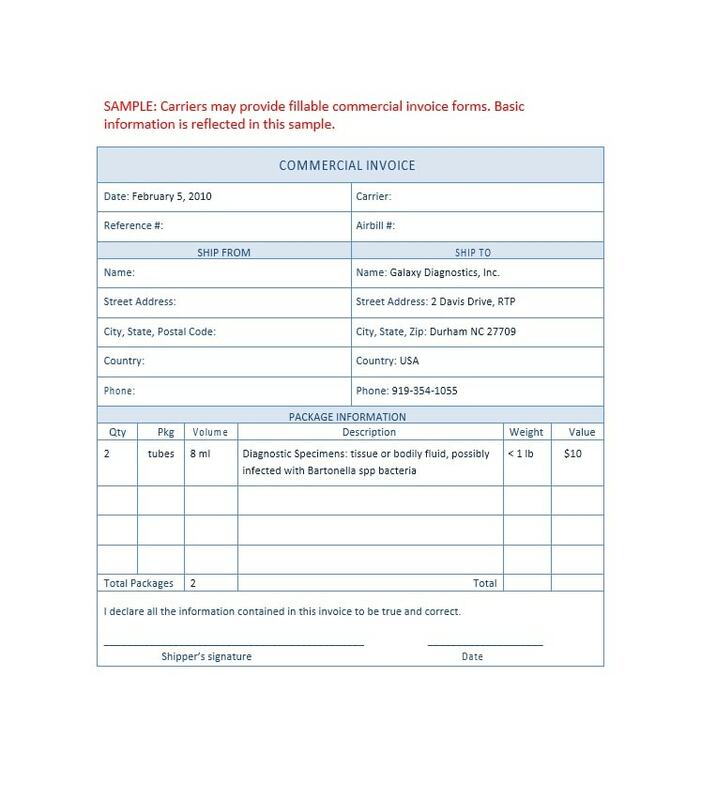 Include all the items in the shipment, their quantity (with the unit used in measuring the item/s), a short description of the item as well as what the item/s would be used for or if they will be sold. Also include the country where the merchandise is from (not necessarily where the merchandise is being shipped from), what they are made of, and item numbers, if any. 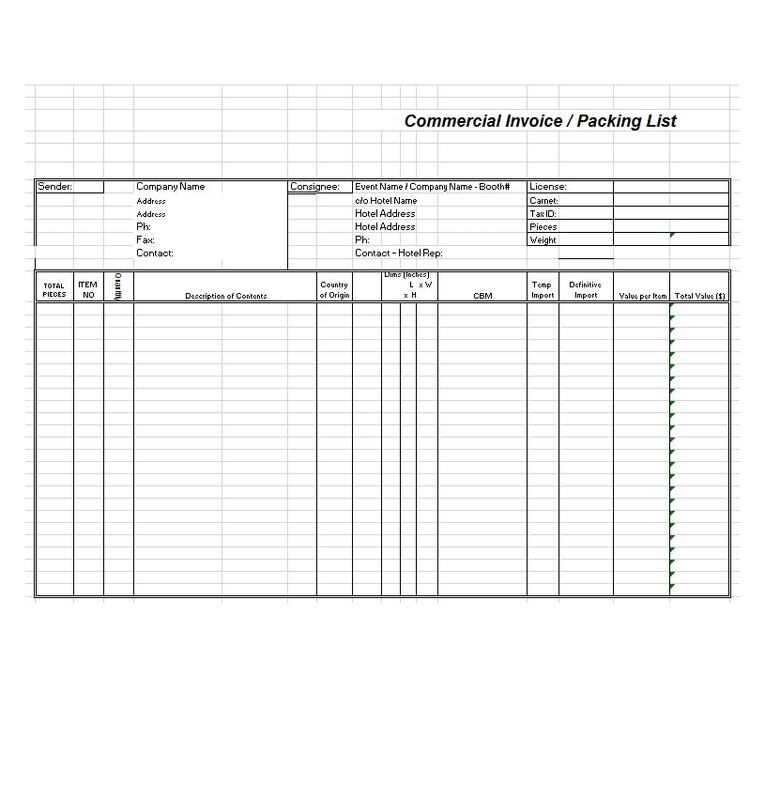 Complete the unit value as well as the total value of your shipment. This would include the worth of each of the items, the total worth of all the items and the currency which was used to calculate the amounts. For items which are imported, the amount you have paid for the merchandise has to be included, without the shipping cost or any insurance charges. For items which are exported, the amount that the merchandise was bought for is needed as well as the currency used to purchase them. 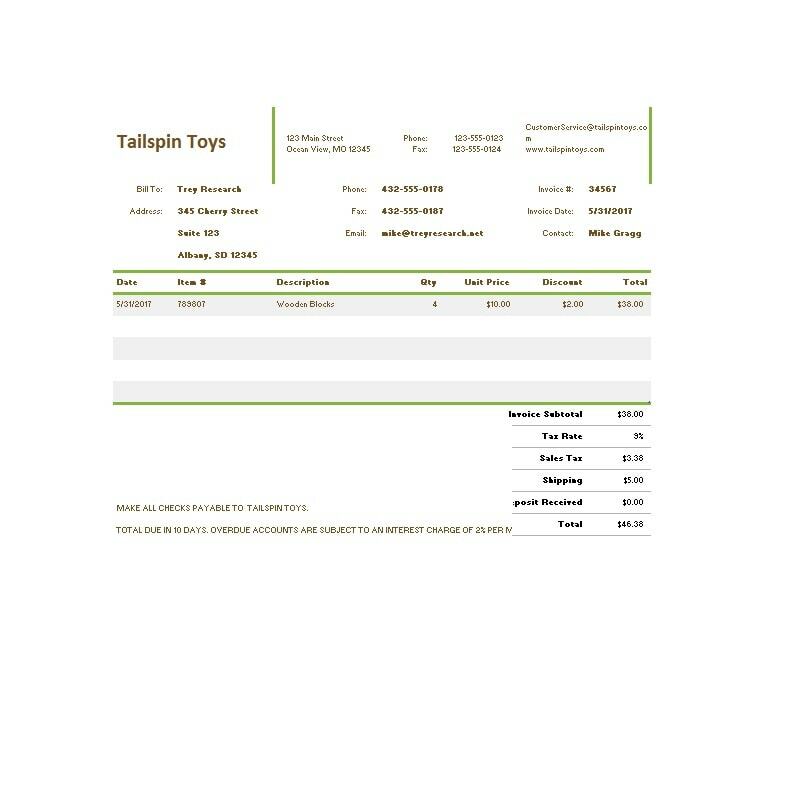 Finalize all the information regarding the shipment. 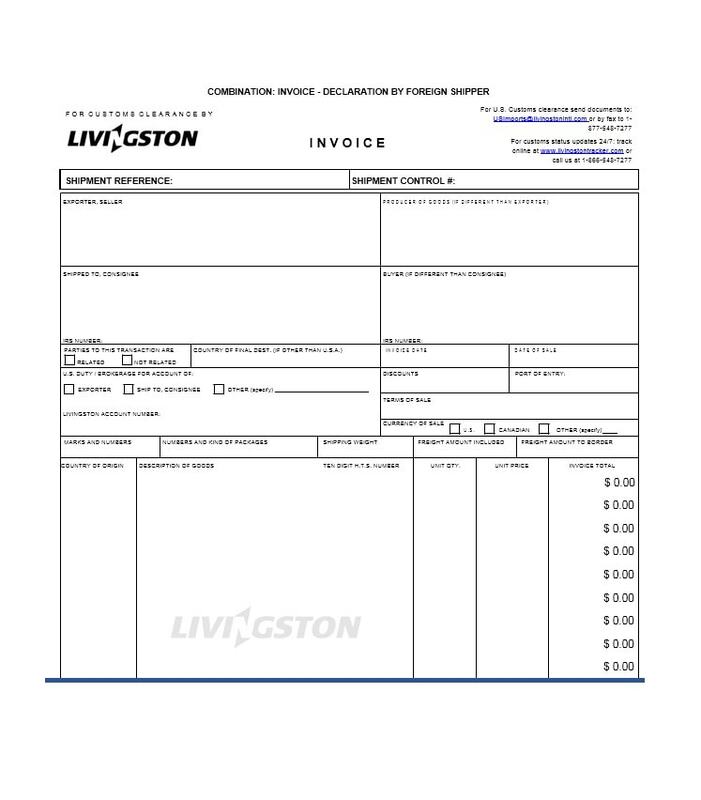 Number and total weight of packages, insurance charges, any applied rebates or discounts, freight charges and any other costs associated with the shipment. 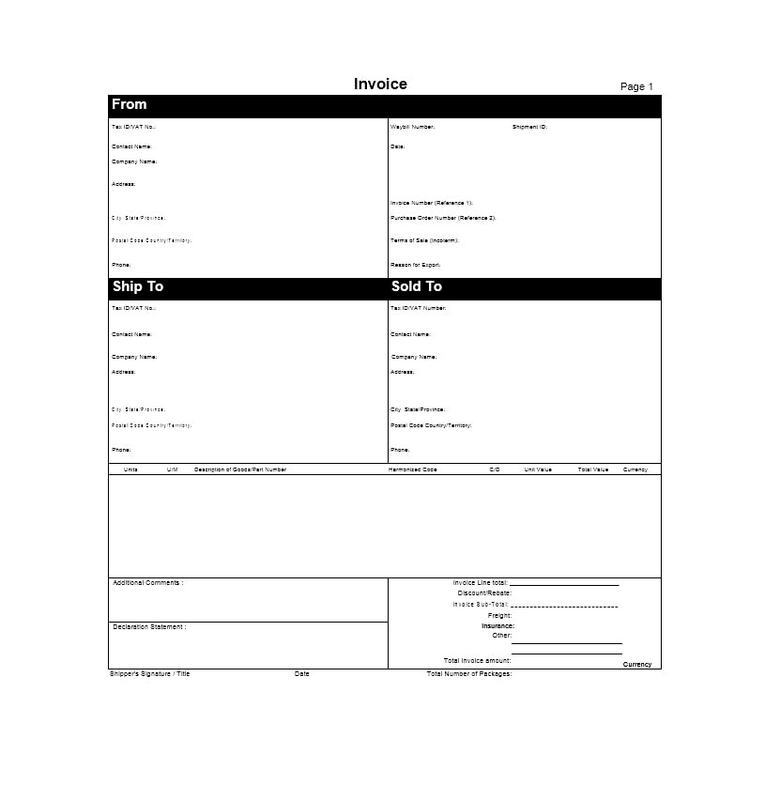 Fill in whatever applies to your transaction and your shipment. 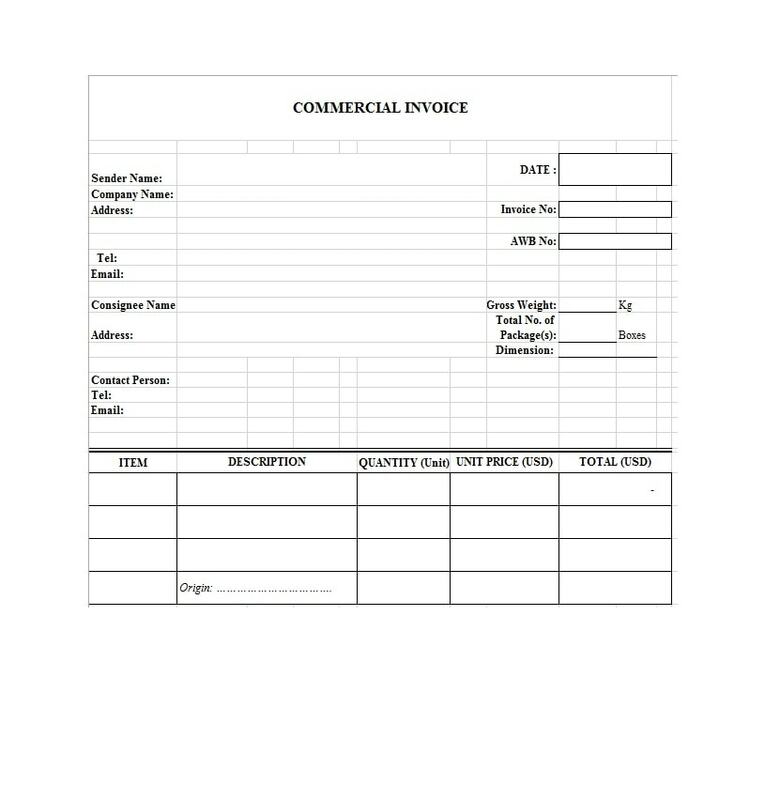 Sign your invoice. 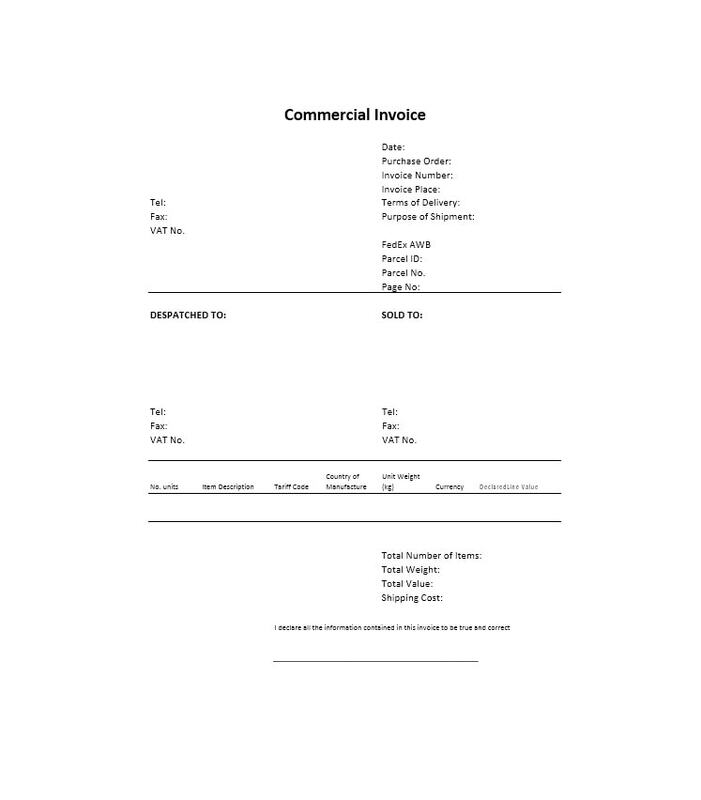 Without a signature, your invoice may not be considered as valid. 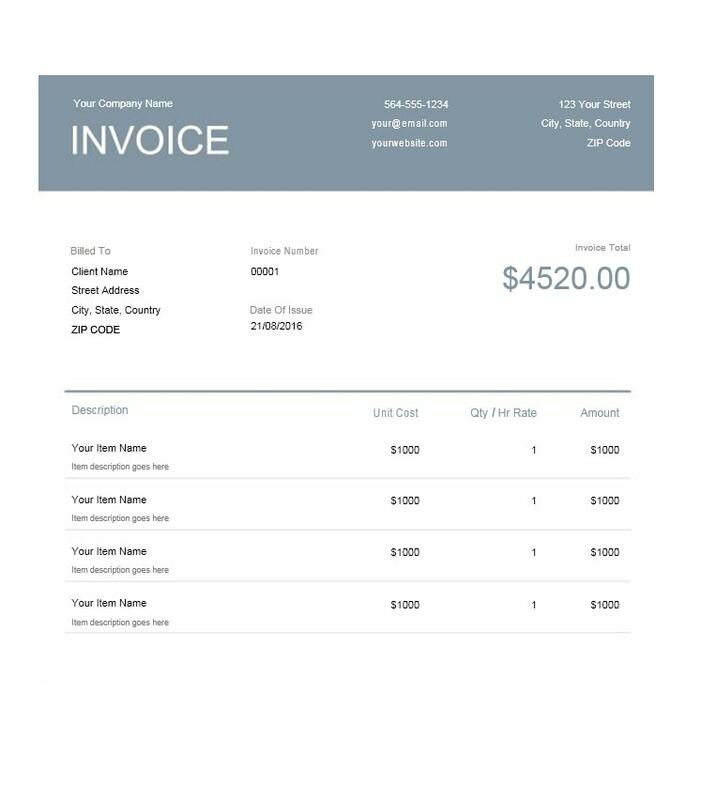 Make copies of your invoice. As you will be giving the original copy to your buyer, you’d have to make as many copies as you would need, for records or for other purposes. 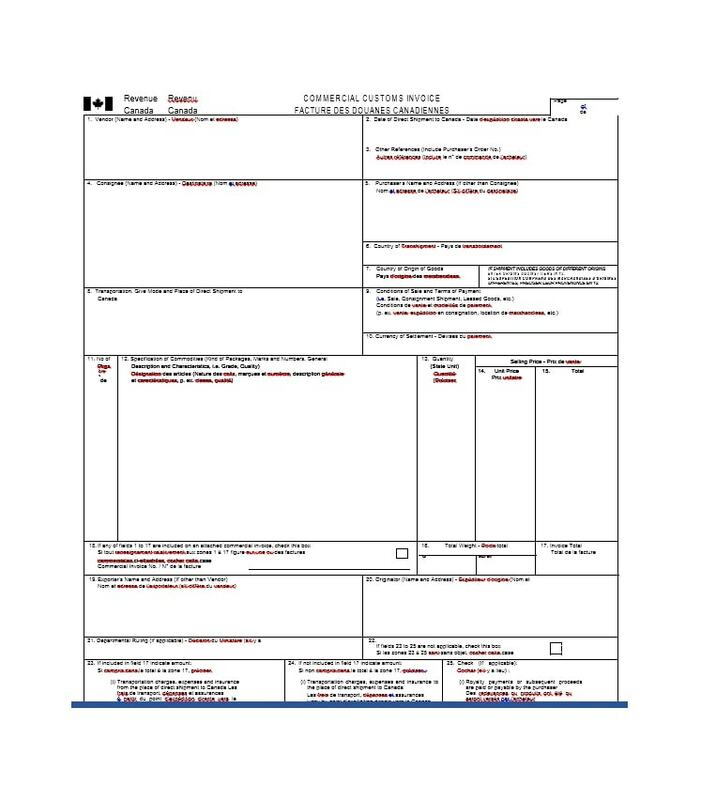 Check to see if all information is accurate and if you need to provide any other supporting documents. 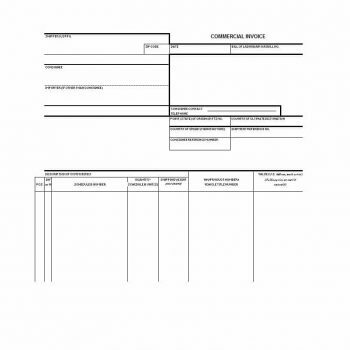 An example of an additional document would be a certificate of origin. 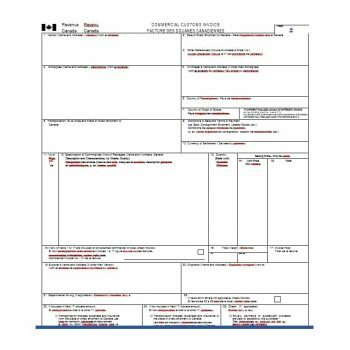 These additional documents are usually needed for international shipments but it would be wise to always check if additional documents are needed, no matter where your shipment will be sent. There you go! 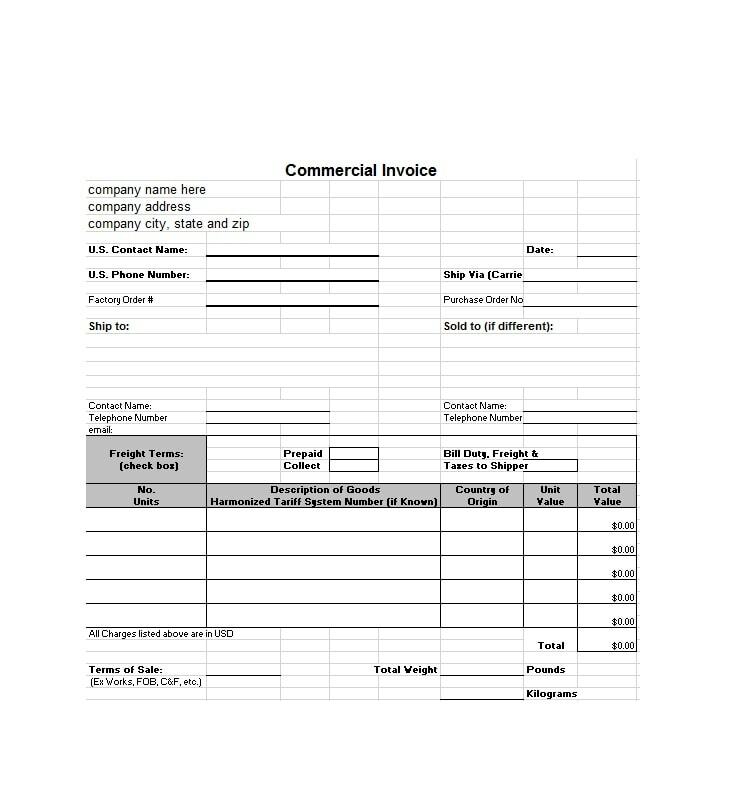 An easy step-by-step guide to accurately and efficiently filling out commercial invoices. This guide will make it easier for you to make faster transactions in your business. 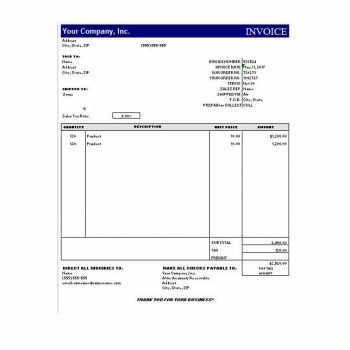 There are many kinds of invoices out there and it would be helpful for you to know what they are and how they differ from each other. 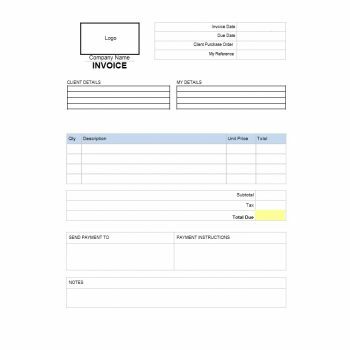 This would help you to determine which invoice should be used in which transactions and which you would need to present when asked for documents as requirements. 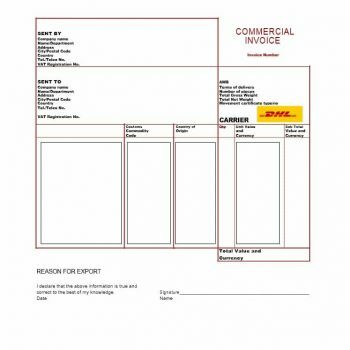 Used in international shipping, therefore contains more detailed information. 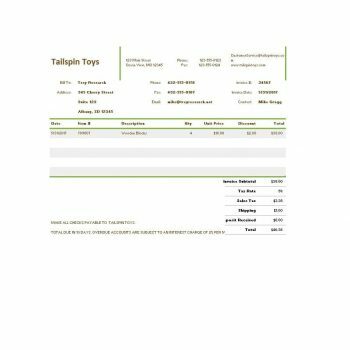 This includes detailed information about item description along with the quantities and weight, the individual and total price of the items and any other shipping costs and charges. 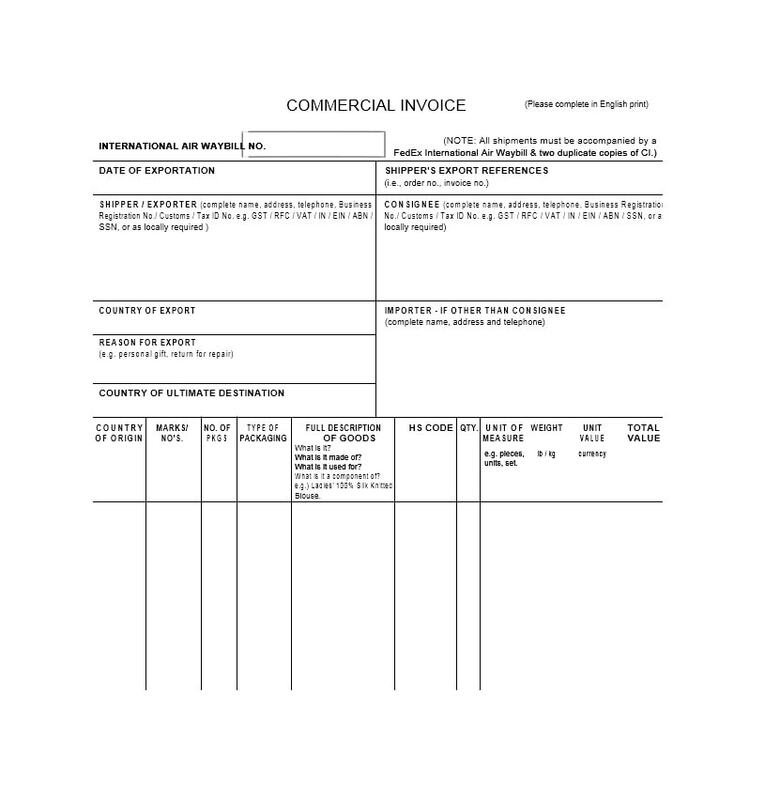 Terms, tariffs, and international standards are taken into consideration when making commercial invoices. 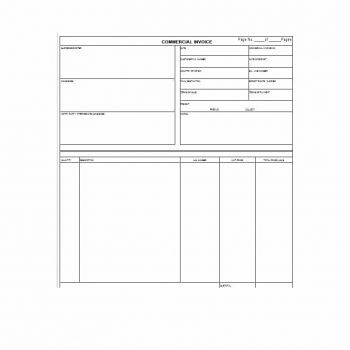 It also contains detailed information about the shipper and receiver. 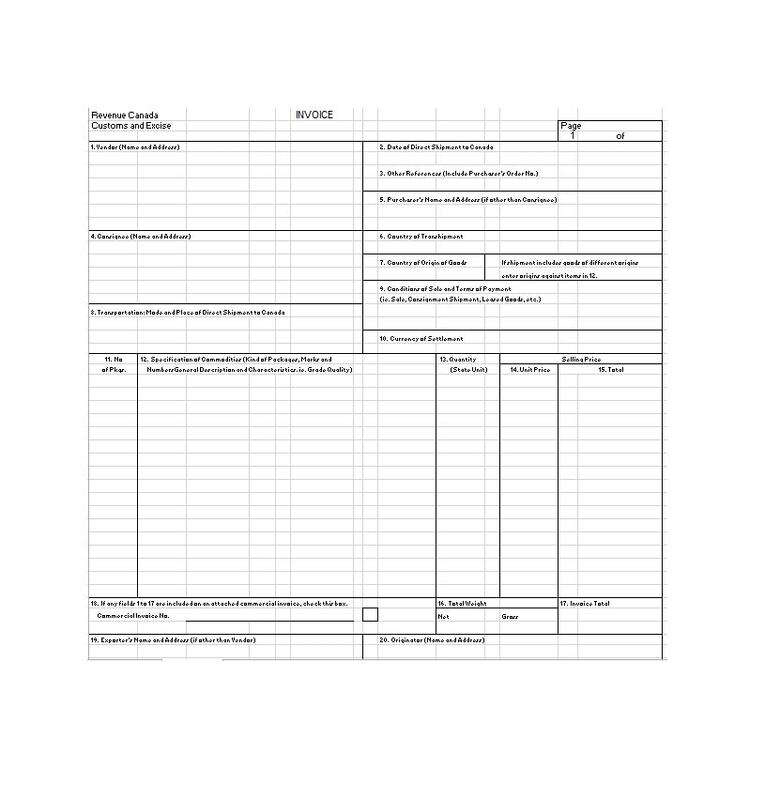 A general list of items sent from one individual or company to another individual or company, used domestically. 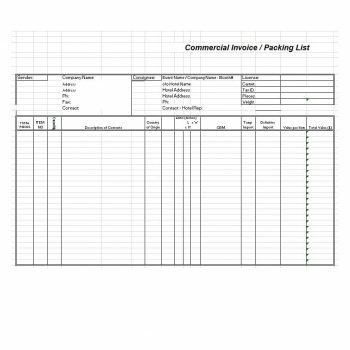 These invoices give an accounting method for inventory of items shipped, without much detail. It may only contain a list of the items along with their individual price and quantity. 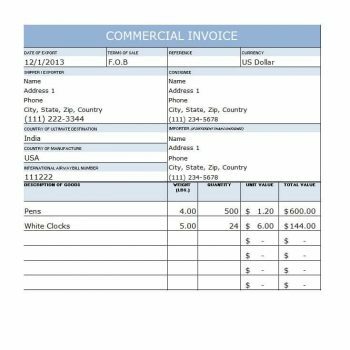 These are the basic differences of the two invoices. 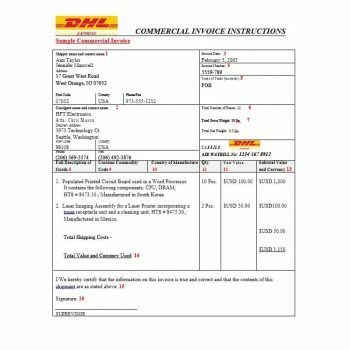 In simple terms, one is more complicated than the other because one (commercial invoice) is used for international shipping while the other (shipping invoice) is used for domestic shipping. 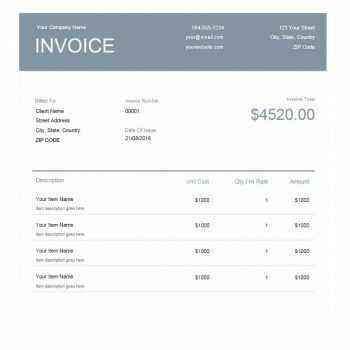 However, both invoices serve as a legal document to prove that a transaction has been made and agreed upon between two parties.